The Patriots finished with 57 touchdowns during the regular season! As always, thank you for your support. Your paid pledges go a long way in helping the Friends sponsor many worthwhile events and activities during the year. 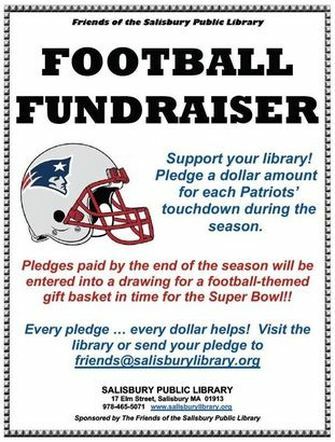 The names of people who pledged and paid were entered into a drawing for a football-themed gift basket that took place before the Super Bowl. It was won by Bob and Andrea Carroll. Again, thanks for your pledges! !